4K video meets Hi-Res sound. The LS-P4 is one of the first linear PCM recorders worldwide to be compatible with recording in the FLAC format. Achieve nearly perfect 96kHz/24-bit recordings that are better than CD quality – but with file sizes which are up to 30% smaller compared to the PCM WAV format. You can also use the LS-P4 voice recorder as a Hi-Res music player for FLAC-format files, or for music in the WAV and MP3 formats. Thanks to the equalizer in the USER mode, customising your playback preferences is easy. You can even enjoy tunes downloaded from high-resolution music distribution websites. The LS-P4 is one of the first linear PCM recorders to feature built-in fade-in/fade-out functionality on the device. It gradually increases the volume of the sound from the first second of the sound source, and reduces volume to the last second. This links songs naturally when recording live sound sources, eliminating unnatural clicking noises. Enjoy simpler overdubbing with your LS-P4 audio recorder. Create your own musical recordings by listening to your original track and, at the same time, recording a new track to create a new song. For instance, you can record your drum track, go back and dub in your rhythm and bass, before adding your vocals to the final mix. Slim and compact device for always taking along: the LS-P4 is a feature-packed high-resolution audio recorder and music player in one. It brings together high sound quality with ultimate ease of use. Clear, dynamic movie sound and music are yours for the taking. Enjoy wide-band recordings from a low 20Hz to a high 20,000Hz. Get a clear overview on the 1.43-inch display featuring a white LED backlight. Connect to your PC cable-free for fast, easy data transfer and battery charging. Conveniently access all the buttons on the front of the recorder. Use a high-capacity microSD or SDHC memory card of up to 32GB. Know if your recording is clipping, the device is charging and more. Feel the quality of the robust and yet stylish metal body. Easily take the LS-P4 audio recorder with you wherever you go and use it together with your camera to capture Hi-Res Audio. It is 60% smaller than the popular Olympus LS-14 recorder and even 45% lighter than the bestselling smartphone in 2016. 60% smaller Compared to the Olympus LS-14. 45% lighter Compared to bestselling smartphone in 2016. Give audio a leading role and create a blockbuster. 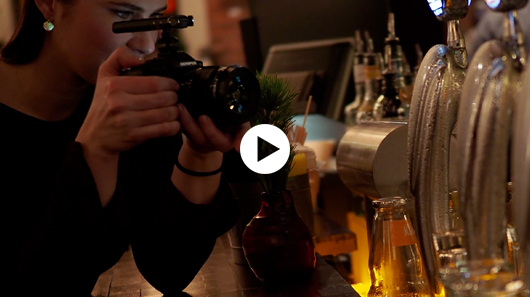 Take a look at what great sound – recorded with the LS-P4 – can do for your video. Roll out the red carpet for the LS-P4 and OM-D E-M1 Mark II! 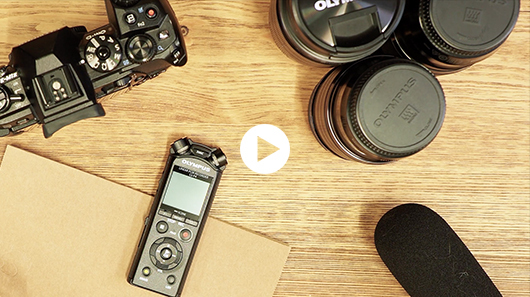 Super compact and lightweight, the LS-P4 is one audio recorder that no videographer should ever be without. Treat your production to Hi-Res sound quality, even when you are on the move. So small it fits in just one hand, the LS-P4 Hi-Res Audio recorder opens up a huge world of creative sound options. Its many features are like music to the ears of every audio professional. With the LS-P4 audio recorder attached to a digital camera, like an OM-D, it picks up the sound even more precisely and clearly while you are filming than the camera’s built-in microphone. Clear audio with the Olympus LS-P4. The sound created by pushing buttons may be picked up, and synchronisation of sound and video in post-production is required. An external hotshoe adapter is required. Fast use of camera’s microphone. As you cannot change the recording settings, make sure you are filming in a quiet surrounding for clear audio. Everybody has a Musician inside! The LS-P4 supports linear PCM recording at rates of 24 bits and sampling frequencies of 96kHz – far surpassing the 44.1kHz/16 bits of CD-quality audio. The LS-P4 audio recorder also offers 7 different sample rates, including the popular 44.1kHz and 48kHz with a 24-bit depth to give you more flexibility. With the LS-P4 Hi-Res Audio stereo recorder, it’s easier than ever to get perfect FLAC, PCM and MP3 recordings. If during manual recording your tracks are under-recorded, just normalise them easily in the menu – directly in the recorder and without the need for a computer. The peak volume in your audio recording will be lifted to the maximum digital scale level to ensure dynamic songs and music anywhere you jam. For voice recording, the LS-P4 features the latest in 2-microphone noise cancellation to give you clearer results – perfect for noisy environments like event venues, train stations, festivals and more. Just select the NOISY mode in the RecScene menu. Or activate the Low-cut Filter to reduce background noises such as air conditioners or projectors while continuing to capture lower frequency conversations or other audio. Enjoy more flexibility when recording. 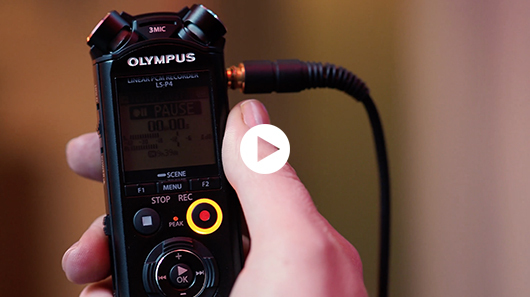 Simply install the free Olympus Audio Controller BT app on your Android-compatible smartphone – and then use your mobile device as a remote control to start and stop audio recording on your LS-P4 recorder. Thanks to preset settings, the LS-P4 gives you optimized sound for select recording scenes. For example, select MUSIC for audio recording across a wider bandwidth with the 3-mic TRESMIC system. Or select NOISY to have a clear voice-only recording using the 2-mic noise cancellation function. Additional scenes include CONFERENCE, LECTURE, MEETING, DICTATION and DNS (when used with voice recognition software such as Dragon® NaturallySpeaking). When you are recording your music using the manual recording level, you also have the option of using the Limiter function. It is effective for preventing unwanted sound clipping. If the input level surpasses the maximum recording level, the Limiter function compresses the peak level. So you can capture your songs exactly as you like, with the clear quality you want. Dynamic sound with every song. By fine-tuning the recording level to match the volume of the audio source, you can capture high-quality recordings that make the most of the dynamic range. Fine level control is aided by the PEAK display lamps and the lever meter on the LCD display. The latest directional quality control technology narrows the directionality of the microphone and, when you increase the recording level, enables you to zoom into the sound source you want to record. This makes the LS-P4 perfect for close-up recording in noisy environments, or when recording from a distance.